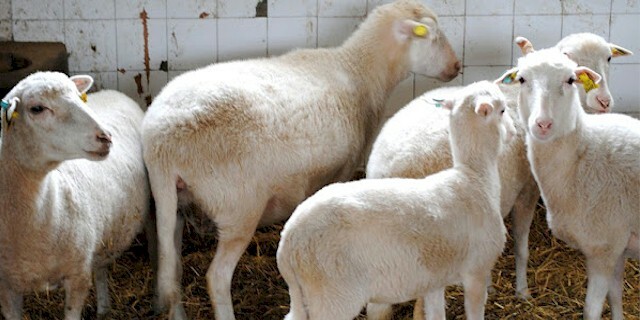 Galician, or Ovella galega, sheep are from Galicia region of Spain. They are small sheep. Their coat is either all white or black. The ewes have smaller horns and those are generally diminutive if they exist at all. While the rams have relatively large horns, in the form of double-spirals. There are two separate ecotypes, Montana, of the high areas as well as Marinano of the low areas. Their total population has dwindled significantly, but their numbers have improved notably in the last few years. Their total number was 4548 in 2012, across 110 farms. Among those animals, 3862 were ewes and 686 were rams. Today they only exist in smaller, isolated communities throughout the Galicia region. But they were once found across Galicia. Currently the biggest concentration is located in Ourense, Spain (south of Lugo and the west of Pontevedra).